Mayor Bill de Blasio's administration recently announced that a number of charter and district schools will become partners this school year in exchanging ideas and best practices. The subject of school discipline offers fertile territory—what we do when things go wrong. While suspension numbers may go down, it's also likely that school culture and safety will continue to be a challenge and an opportunity to get beyond the reductive charter-vs-district-school conflicts of recent years. Specifically, it's a chance for some district schools to learn from the charter experience about the importance of purposefully executing a vision for school culture. At the same time, it's also an opportunity for certain charters to move beyond their reliance on "no excuses" disciplinary practices (of the kind captured in the memorable viral video of a 1st grade Success Academy teacher) that don't equip students to become considerate, independent adolescents and adults. The most hopeful outcome would be to expand on the current impetus for "restorative justice" in schools in ways that create "intentionally restorative" school cultures. My experience in both charter and district schools tells me that restorative practices aren't just useful for remedying student misbehavior; they also help students become empathetic, connected, and community-oriented citizens. To recap the story to this point: In an effort to reduce reliance on the out-of-school suspensions that disproportionately impact students of color, many schools have turned to restorative justice as an alternative to traditional discipline practices. In restorative justice schools, when there are breaches of cultural norms and behavioral expectations, students are held accountable for repairing the harm their actions cause. They are obliged and compelled to make things right with the victims of an offense and with the school community. For example, a former student of mine snatched a hijab off a classmate, embarrassing and angering her and shocking and disappointing their teachers. We worked with the young man to first reflect on and take responsibility for his actions and their impact on others. Then he was asked not only to formally apologize to his classmate and the entire class, but also make a classroom presentation on the significance of the hijab. Intriguingly, in the process he described his own inner turmoil as a recent Muslim immigrant struggling with his identity. Clearly, the resolution of this incident was more meaningful for everyone involved than an out-of-school suspension or a harsh disciplinary response that could well have undermined the young man's already conflicted sense of self and failed to address the victim's needs. It's much better for students to talk about their mistakes and be held accountable for providing healing to those they've harmed. This can't happen if they are out of the building or if schools don't encourage, value, and nurture student voice and dignity. In practice, however, restorative justice efforts have produced varying results. Critics point to schools they say are on a downward trajectory toward chaotic environments. In my view, the problem is that restorative practices too often are applied to the "back end" of school culture—what we do when things go wrong. While suspension numbers may go down, it's also likely that school culture and safety will continue to be a challenge. Instead, restorative practices should also become part of the "front end" of culture. 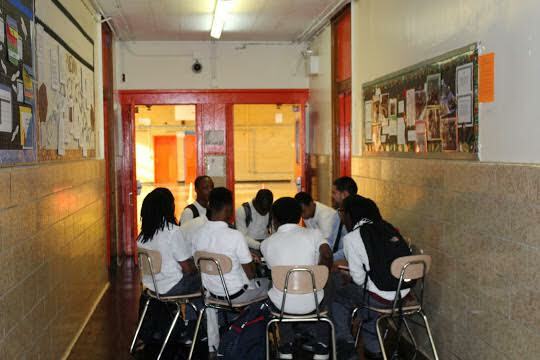 Schools that are meeting with success have practices that create an intentionally restorative school community. They're committed to building strong relationships between students and adults and fellowship within the student body through daily student circles or advisories and by practicing affective language and fair process that reflect a philosophy and set of beliefs about children and communities. Investing in this "front end" of school culture allows the restorative efforts on the back end to be successful. In my experience, schools that have struggled with adopting restorative practices lack this critical understanding. They're looking for a solution to high suspension numbers rather than responding to what the students need: safety, community, and love. The key word in establishing a restorative school culture is: Intentionality. Everything about school culture should be intentional. How will children enter the room? What do their notebooks look like? How long will it take students to transition to and from lunch? "Sweating the small stuff" matters. It's crucial to getting the big stuff right; it's also too important to be left to individual teachers to "figure out" on their own. In collaboration with teachers, school leaders should establish and maintain systems and routines that support a culture of learningwhat we do when things go wrong. While suspension numbers may go down, it's also likely that school culture and safety will continue to be a challengewhat we do when things go wrong. While suspension numbers may go down, it's also likely that school culture and safety will continue to be a challenge—ensuring through professional development, for example, that every adult in the building has a common vocabulary and tools to respond to breaches of the school's behavioral and cultural expectations. These systems are adjusted based on data tailored to meet the needs of particular students. Despite some unfortunate examples of extreme charter school discipline, a lesson to be learned from charter schools is that a healthy school culture is the prerequisite to an environment of learning in every classroom. Absent that, efforts to increase student achievement through instructional rigor and engagement are likely to only yield moderate results. A significant component of many charters' success in improving student achievement is their intentionality as it relates to school culture. They sweat the details, and commit to executing their vision of school culture in order to create an environment where students can excel. So the new partnerships being forged between district and charter schools create unique opportunities to address a critical question: How do we create school communities that are intentionally restorative? Jared Roebuck is the high school principal at DREAM Charter School in East Harlem. He has been active in the restorative justice community, leading professional development on restorative practices for district and charter school educators in New York City. This article originally appeared on the Urban Matters blog, Center for New York City Affairs.